In the fall of 2015, Loberg Construction broke ground on a 27,000 square-foot, single-story building at Blackberry Falls, a 4.6-acre office complex in Hoffman Estates, IL. The build-to-suit project was specifically designed for Northwest Health Care Associates, whose physicians, nurses, and other medical staff have provided primary and specialty healthcare and diagnostic imaging services to Illinois residents since 1981. This would be Northwest’s third location, which would employ a staff of about 50 physicians, nurses, and other healthcare professionals and include an imaging center for a wide range of radiology services such as MRIs, CT scans, EKGs, and X-rays. 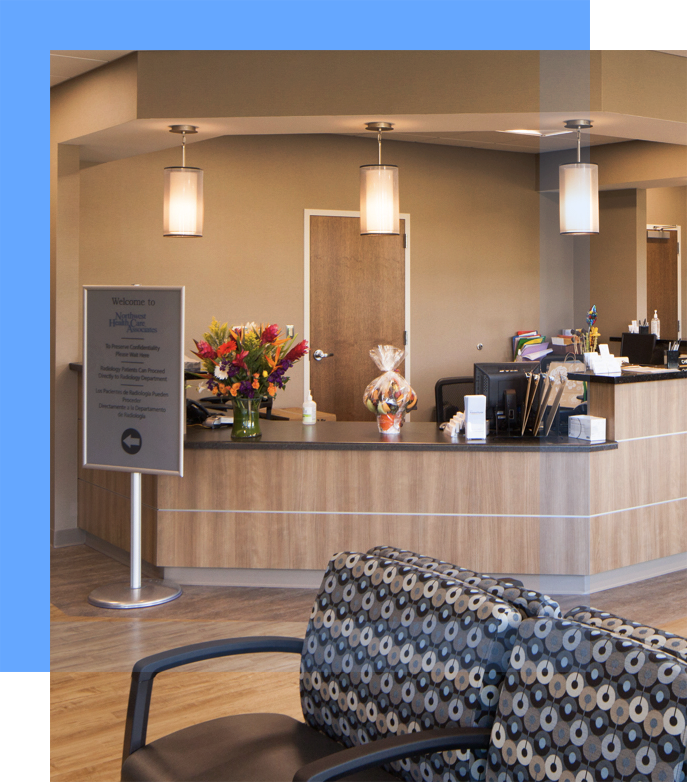 With our extensive experience in constructing medical facilities, Loberg Construction was hired as the General Contractor by Caruso Development to build the new structure and multi-specialty clinic designed by InterWork Architects. Loberg Construction finished the building’s construction over a nine-month period — on time and within budget. Loberg Construction also performed redevelopment to the exterior of the entire site, reconstructing the underground storm drain and sewage structures, and parking lot. Redeveloping a vacant parking lot might sound like a straightforward endeavor, but often is far from it. Our excavation uncovered a maze of underground utilities, including a two-inch gas service line that feeds the adjacent tenant, along with an existing gas line that ran directly across our footings/foundations. We worked with multiple utility companies to remove or relocate the utilities and were able to proceed with construction according to plans without delays or cost-overruns. Another unforeseen issue that arose during the construction phase involved the pre-existing pond in front of the new building which served to catch stormwater runoff from the entire office complex. The Water Reclamation District made a new requirement for the installation of a sediment forebay, to prevent the likelihood that a potential flood might cause contaminated water from the pond to pollute nearby Poplar Creek. Loberg’s crew constructed the forebay but rather than put it in the pond, they located the forebay in front of it, so that sediments would be filtered out before reaching the pond. It was extra work but our engineers met the District’s requirement and kept the project on track with no delays. Loberg completed construction in August 2016, and Northwest Health Care Partners moved in shortly thereafter. In all, about 20 trades collaborated on the project, including electricians, plumbers, HVAC, concrete, steel, masonry, excavation/earthwork, site utilities, painters, carpenters, asphalt paving, landscapers, and fencing contractors.